Amazon's new version of Kindle called Kindle Fire HD Amazon introduced one the latest version of Kindle branded as Kindle Fire at a hectic New York City event in November 2011. 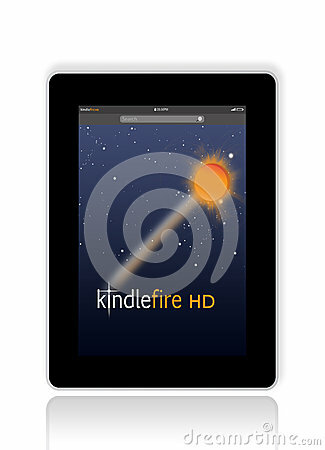 Now has come the time for Amazon to launch Kindle Fire HD (High definition). World's most advanced 7 tablet 1280x800 HD display with polarizing filter and anti-glare technology for rich color and deep contrast from any viewing angle Exclusive Dolby audio and dual-driver stereo speakers for immersive, virtual surround sound World's first tablet with dual-band, dual-antenna Wi-Fi for over 35% faster downloads and streaming (compared to the iPad mini) Front-facing HD camera for taking pictures or making video calls using Skype, Facebook, and other apps Learn about Amazon's content selection of over 23 million movies, TV shows, apps, games, books, magazines, songs, and audiobooks Every Kindle Fire comes with great features including email, web, photo gallery, X-Ray, Read-to-Me, and more Amazon offers exclusive services that improve your Kindle Fire and more, such as Amazon Prime, Kindle FreeTime Unlimited, Cloud Player, Cloud Drive, and Whispersync NEW: Kindle Fire owners get 500 Amazon Coins (a $5 value) to spend on Kindle Fire apps and games.